We all use VisualStudio’s autocomplete menu, aka IntelliSense. This is very useful, is not it? 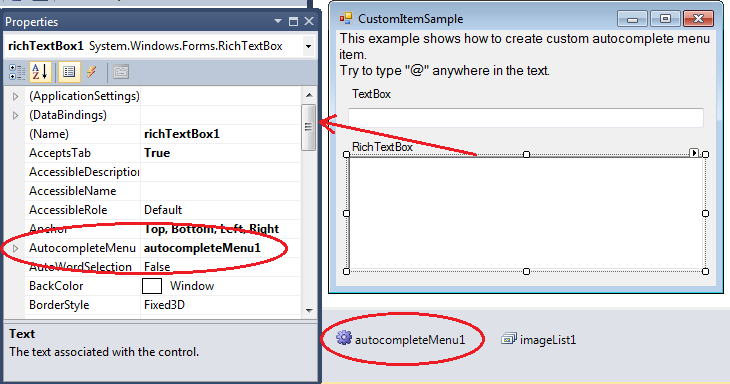 Unfortunately, .NET FW does not contain built-in component for autocomplete menu. The proposed control fills this gap. AutocompleteMenu allows you to easily embed a drop-down hints into any TextBox or RichTextBox on your form. AutocompleteMenu – main component of which contains the basic functions. 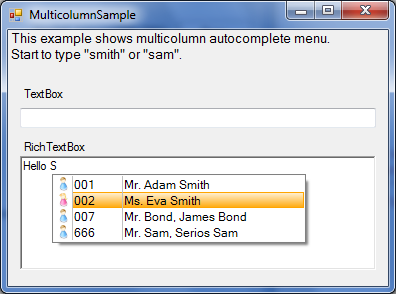 It subscribes to the events of TextBox, looks for suitable variants, shows a drop-down menu and inserts new text into textbox. AllowTabKey – Allows TAB for select menu item. AppearInterval – Interval of menu appear (ms). ImageList – Image list used for items. Items – list of text of menu items (simplest variant of usage of AutocompleteMenu). MaximumSize – Maximum size of popup menu. MinFragmentLength – Minimum fragment length for menu appearing. AutocompleteMenu appears only if current fragment around caret has no less then MinFragmentLength symbols. SearchPattern – Regex pattern for serach fragment around caret. AutocompleteMenuHost – visual component that derived from ToolStripDropDown. This control allows you to display the menu without losing focus on the main form. AutocompleteListView – visual component that inherited from UserControl. With GDI+, it draws the items of the drop-down menu. 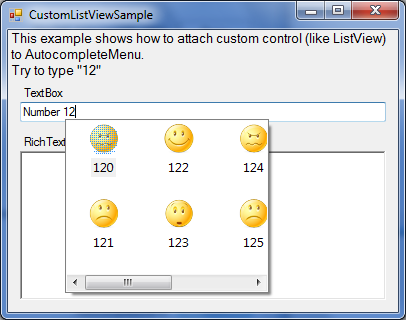 This component is similar to ListView but it allows you to display a large number of elements with a good performance. Text – text for inserting into textbox. MenuText – this text will displayed in popup menu. ImageIndex – index of image for this item. ToolTipTitle – title for tooltip. If ToolTipTitle is null, tooltip will not appear for this item. ToolTipText – text of tooltip. Tag – you can store any data here. GetTextForReplace – returns inserting text. You can dynamically change inserting text. For example, you can insert current date. Compare – this method defines will this item visible in menu or not. By default this method make visible only items begin with given fragment. But you can override this behaviour. For example, you can compare by substring, or make fuzzy comparison. OnSelected – this method is called when text was inserted in textbox. You can make here some additional operations with text. For example, you can move caret into some position. The library also contains a few useful classes derived from AutocompleteItem: SnippetAutocompleteItem (can be used for inserting of code snippets), MethodAutocompleteItem (can be used for inserting of method name after dot), SubstringAutocompleteItem (compares text by substring), MulticolumnAutocompleteItem (draws multicolumn menu). 1) Throw AutocompleteMenu component on your form. More details see the example AdvancedSample of demo application. Ctrl+Space – forcibly opens AutocompleteMenu. Up, Down, PgUp, PgDown – navigates across menu. Enter, Tab, DblClick on the item – inserts selected item into text (Tab works only if AllowTabKey is true). Note that these keys are working, despite the fact that the focus is in the textbox. Item’s tooltip appears if you click on the item. You can use the custom controls for displaying AutocompleteMenu (like ListView, ListBox, DataGridView, TreeView, etc). 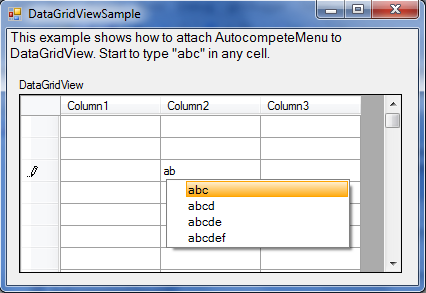 For this, create own control (derived from Control) and implement interface IAutocompleteListView. More details see in CustomListViewSample. It is frequently necessary that the menu display not a fixed set of items, but was changing dynamically, depending on the text. This task can be solved. 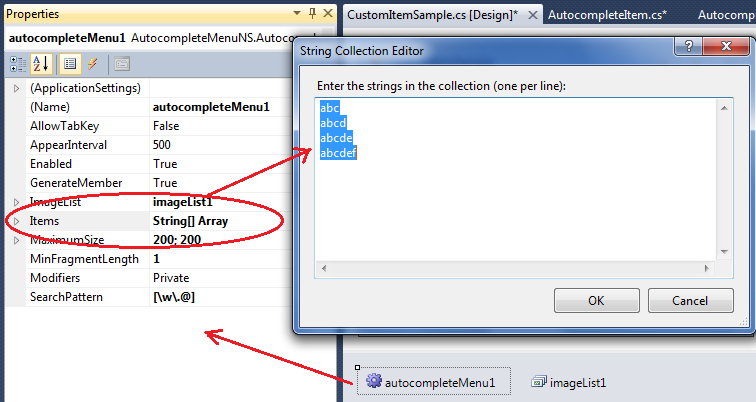 Note that method SetAutocompleteItems() of menu takes IEnumerable as collection of displayed items. So, you can do not generate a list of items at the start of the program, and generate it dynamically at the time of the call the enumerator from the menu. Fully implemented sample see in DynamicMenuSample. 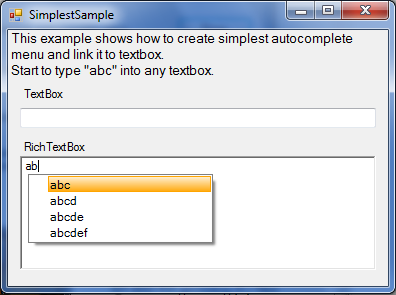 Autocomplete menu is compatible with TextBox, RichTextBox, MaskedTextBox, FastColoredTextBox[^] and other controls derived from TextBoxBase. Even if your control do not support these methods, you can create own wrapper for it. For this, you must create own wrapper class and implement there interface ITextBoxWrapper. SimplestSample – shows how to use the control by simplest way. CustomItemSample – shows how to create own class derived from AutocompleteItem. 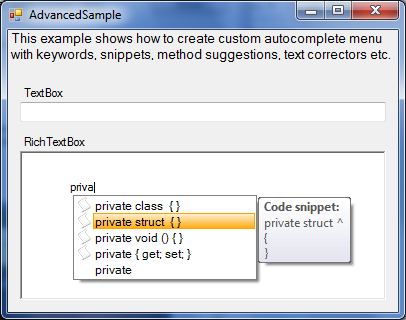 AdvancedSample – shows how to create custom autocomplete menu with keywords, snippets, method suggestions, text correctors etc. ExtraLargeSample – demonstrates performance of the component with extra large list of menu items (one million). ComboboxSample – shows how to create analog of Combobox, but with very large dropdown list and with searching by substring. DynamicMenuSample – this example shows how to create dynamic context-sensitive autocomplete menu. 13 Apr 2012 – First release. 21 Apr 2012 – The control is refactored. Added support of the FastColoredTextBox[^] and other controls. 9 May 2012 – The control is refactored. Some samples were added. 3 Dec 2014 – Property Colors was added. 8 Feb 2015 – Small bugs were fixed. 19 Mar 2015 – Small bugs were fixed.